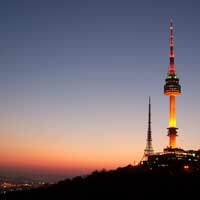 Looking for a cheap ticket to Seoul? Here you can search all major low-cost airlines for cheap flights to Seoul. Before you book a flight you can use Utiket to find the cheapest flights to Seoul for Korean Air (KE), Asiana Airlines (OZ), Garuda Indonesia (GA), Air China (CA), Japan Airlines (JL), PAL Express (PR). All flight data are real-time and accurate. Follow the links to search and book your cheap ticket to Seoul directly with the airline or one of our partnering travel agents. The metropolitan area of Seoul is being served by several airports: Incheon International Airport, Seoul Gimpo International Airport. You can find more information or the cheapest tickets to all these airports here on Utiket. The Incheon International Airport of Seoul is South Korea's largest and busiest airport with close to 40 million passengers a year. The Incheon Airport is also one of the best airports in the world according to SkyTrax; it has been voted in the top three since 2009. Read more about Seoul Incheon International Airport. Read more about Seoul Gimpo International Airport. This is a list of all airlines flying to and from Seoul and how many flights and destinations they serve. You can see a complete list of airlines and flight options to Seoul.